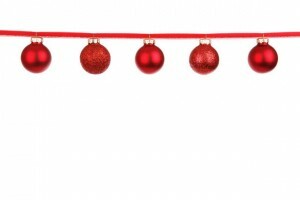 While the holidays are naturally a time filled with food, family and fun – the friendly folks at Highlight Homes and Highlight Home Restoration have compiled a short list of five great ways to make the holidays even happier. From our family to yours, we wish you a Joyous Holiday Season and a Happy New Year! 1) Give to Those in Need: Highlight Homes and Highlight Home Restoration was so proud to offer our services to the victims of the Atlanta floods in late 2009, that we have opted to continue that mission with our very special “Help Atlanta” division. We are primed and ready to rush to the aid of local victims of natural disasters who reach out to us and submit a request to helpatlanta@highlighthomesga.com. 2) Take it on the Road: While so many Atlantans will opt to take their holidays on the road this season, Highlight Homes went mobile this year in a completely different way. Through our new partnership with mobilezen, we launched an innovative TextSite. To access the Highlight Homes TextSite through your mobile device, simply text “builder” or “HighlightHomes” to 99699 or click HERE to catch a sneak peek of our TextSite online. 3) Smile Pretty for the Camera: As we all eagerly await those annual holiday photos sent to our inboxes and mailboxes from friends and loved ones, Highlight Homes is proud of the fact that we were in the spotlight in several publications this year. Featured in Atlanta Home Improvement Magazine last December, Highlight Homes and Highlight Home Restoration is also honored to have been featured in The Atlanta Journal Constitution and Remodel Atlanta Magazine, among others this year. 4) Spread Glad Tidings: Did you know that nearly 75% of our remodeling business is based on referrals? If you know someone who is considering a renovation of their current home, we would truly appreciate your help in spreading the word of Highlight Home Restoration’s high level of quality craftsmanship and dedication to pleasing our clients. Please feel free to pass along our phone number at 678.873.9234 and e-mail address at info@highlighthomesga.com. THANK YOU! 5) Begin Planning for the New Year: Aside from those New Year’s Resolutions we are all planning to make on December 31 and January 1, there are other changes you can begin planning for right away. Make a list of renovations you are considering undergoing at your home, then call the design/build team at Highlight Home Restoration to set the wheels in motion. We are happy to meet with you , offer suggestions, and write estimates for some or all of the jobs you have planned. By tackling them all at once, you could find yourself walking away extremely happy with significant savings. Call us TODAY to schedule your on-site evaluation at 678.873.9234 or fill out our convenient online contact form. For centuries, the hearth has been symbolic of home, warmth and security. In many modern homes, the fireplace serves as far more than just a place to warm yourself and hang the stockings with care. When designed properly, it could not only become the focal point of the room but could also set the tone for the atmosphere of the entire living space. In the event that you have grown tired of the outdated or understated appearance of your fireplace, a quick remodel might just transform your hearth into a space Santa would be honored to arrive from. 1) Stacked Stone – A lovely stacked stone hearth can lend the impression of a luxurious mountain lodge to the room. Throw in some exposed beams and hardwood floors, blended with naturally-inspired décor and you can create a beautiful, tranquil environment. An option to stacked stone is the smoother river rock, equally stunning but slightly more casual. 2) Marble – A marble fireplace conveys the notion of elegance and refinement, and is best accompanied by rich crown molding and flanked by built-in bookcases that soar to the ceilings. Line the shelves with stylish bric-a-brac, black and white photos, and hard-covered books – and place a vase of fresh flowers on the mantle to produce a sophisticated ambiance. 3) Concrete – One of the more recent arrivals on the fireplace surround scene, a concrete hearth is perhaps the most modern in appearance – offering clean lines and a chic vibe. Since concrete can be stained and sealed, you can choose from a variety of colors and sheens – as well as textures. It can appear austere and striking – much like a piece of modern art. 4) Brick – One of the more traditional materials for hearths, brick holds timeless appeal. Can be made to recreate the look of the brick on the exterior of your home for a consistent feel, or can be created to have a look all its own. If you are an antique buff, the incorporation of reclaimed bricks from an older home or building blended with the use of white mortar will add an air of Old World Charm to the room. Whereas intricate use of patterns might lend itself to a more Modern feel. 5) Wood – The use of wood for the mantle and surround of the fireplace is perhaps the most economical and flexible option, but still allows for creativity when defining the theme for the room in which the fireplace is sent. 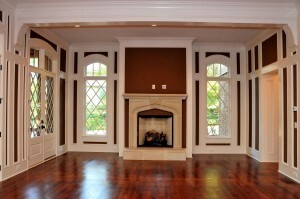 When painted the same color as the trim, the fireplace may give a room a traditional Colonial feel. The use of old timber may add to a rustic Great Camp mood – try to repeat the use of wood throughout the room to enhance this impression. Intricate carvings will add an air of sophistication, while simpler styles will increase the likelihood of your mantle’s timelessness. 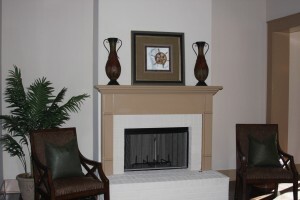 A new fireplace design could really heat things up at your home. A relatively simple remodel job on the surface, the difference it makes to your home’s interior or exterior could serve as the “firestarter” for more exciting big changes down the road. It’s also a terrific way to judge the skill and work habits of the remodeling company you choose. At Highlight Home Restoration, we don’t just renovate rooms – we create unique living spaces where you and your family will make memories together for years to come. 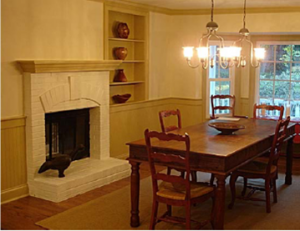 To discuss the possibility of creating a new look for your home’s hearth or fireplace surround, contact the talented team of renovators at Atlanta-based Highlight Home Restoration by calling 678-873-9234, e-mailing info@highlighthomesga.com, or filling out our helpful online contact form. We look forward to the opportunity to help you get fired up about all the possibilities your home holds! 1) Make it a Double: If you currently have single pane windows, the addition of energy-efficient double pane windows will help seal out moisture and cold – effectively saving you a pretty penny in heating costs. Fall is a terrific time to schedule a window and/or replacement, before Winter’s chill settles over Georgia and seeps through the cracks and casements of your current windows. This benefit will continue year-round into the warmth of Spring and scorching days of Summer by sealing OUT the heat and locking IN the cooler air-conditioned air, thus saving you again in cooling costs. 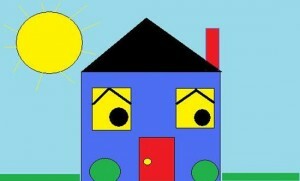 2) Old = Mold: If you live in an older home, your current windows might actually prove a danger to your family’s health. Old windows often equate to lead paint and dated sealing. The proven toxicity of lead paint (often found in homes constructed prior to 1978) can pose a threat to your family’s well-being and must be removed by a certified professional. Dated sealing around windows and doors becomes inefficient with time, letting in more than just cold air. Inefficient sealing can also allow moisture to enter the home and seep into the walls – which could, in turn, lead to mold. Mold has the potential to spread quickly throughout your home and can be dangerous for people with suppressed immune systems or acute cases of asthma. According to the United States Environmental Protection Agency, mold exposure can also lead to allergic reactions and respiratory complaints. 3) Save the Planet: Many modern windows are earth-friendly – not only will you be protecting your family and your wallet, but you will also be saving the planet in small ways every day! By installing energy-efficient windows, you will be ensuring a cozier seal on your home’s interior from the outside elements. If you regularly heat your home by means of a fossil fuel like natural gas, this seal will equate to a significant reduction in green house gases emitted from your home into the environment. 4) Thank You, Uncle Sam: You have until December 31, 2010 to purchase and install qualifying energy-efficient windows and doors to be eligible for a federal tax credit of up to 30% of the purchase price (equal to or less than $1,500). To meet the requirements, windows and skylights must have a U-factor and Solar Heat Gain Coefficient (SHGC) of less than or equal to 0.30. These ratings must be certified by the National Fenestration Rating Committee (NFRC). To make things simple, be on the lookout for an EnergyStar Label indicating that the product that you are buying is either eligible in the State of Georgia or in all 50 states. 5) Satisfaction Guaranteed: Most respected window and door manufacturers extend a warranty on all of their products. For instance, popular manufacturer Marvin Windows and Doors will honor a 20-year warranty on their insulated windows to guard against visible obstruction caused by a failure of the insulating glass air seal and a limited warranty guaranteeing their products will remain free from defects in manufacturing, materials and workmanship for up to 10 years from the purchase date. The talented craftsmen and renovators at Highlight Home Restoration have each received their Certified Window Installers Level RLC-1 from the Architectural Testing Institute, Inc. Simply put, this means we are certified to install windows and doors for every major manufacturer in compliance with each individual company’s installation standards. Add this to the fact that Highlight Home Restoration is also Lead-Based Paint Containment certified, and we are the ideal choice for window and door replacements in homes constructed prior to 1978 all the way up to new construction. We are also wholly concerned with maintaining our standards as a Green Builder in Atlanta, so we will be happy to provide the research and proper installation necessary to make sure your new windows and doors are energy-efficient. 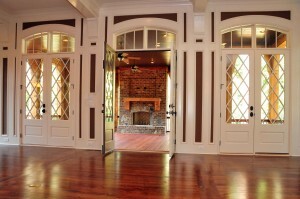 To schedule an assessment of your home’s windows and doors, call Highlight Home Restoration TODAY at 678.873.9234. We can also be reached via e-mail at info@highlighthomesga.com or through our convenient online contact form. To learn more about Highlight Home Restoration and our parent company, Highlight Homes, LLC – we invite you to visit us online. We look forward to hearing from you soon, and welcome the opportunity to show you that Highlight Home Restoration isn’t just another pretty face, either!